The Community Care Fund (CCF) will launch a three-year pilot scheme on October 3 to provide free cervical cancer vaccination for teenage girls from eligible low-income families. The Chairperson of the CCF Task Force under the Commission on Poverty, Dr Law Chi-kwong, said at a press briefing today (September 23), "The total provision of the Free Cervical Cancer Vaccination Pilot Scheme launched by the CCF is about $98.75 million. It is expected to benefit about 31 000 girls. Eligible beneficiaries are girls aged 9 to 18 who receive Comprehensive Social Security Assistance, and female students aged 9 or above who receive full grant under the School Textbook Assistance Scheme. "The Family Planning Association of Hong Kong (FPAHK) has been commissioned as the implementing agent of the pilot scheme. Apart from providing vaccination for eligible teenage girls at its Youth Health Care Centres, the FPAHK will also undertake publicity and education work to enhance understanding among parents and teenage girls about cervical cancer and its prevention, and encourage parents to seek early cervical cancer vaccination to protect the health of their daughters," Dr Law said. The Executive Director of the FPAHK, Dr Susan Fan, said, "We will provide eligible applicants with free vaccination and related services at our three Youth Health Care Centres in Wan Chai, Mong Kok and Kwai Fong. They may call these centres for registration and booking of first appointment. Applicants aged 18 or above must bring along documentary proof in person to process the application and receive the first dose of vaccine at the first appointment. Applicants under 18 years old must be accompanied by a parent or legal guardian at their first appointment." Cervical cancer is a common female cancer caused by certain types of human papillomavirus (HPV). HPV infection can be prevented by vaccination, which is recommended for girls starting from the age of 9. When girls get vaccinated at a younger age, their body produces a higher level of antibodies. The protection is also greater when the vaccine is received before the start of sexual activity. 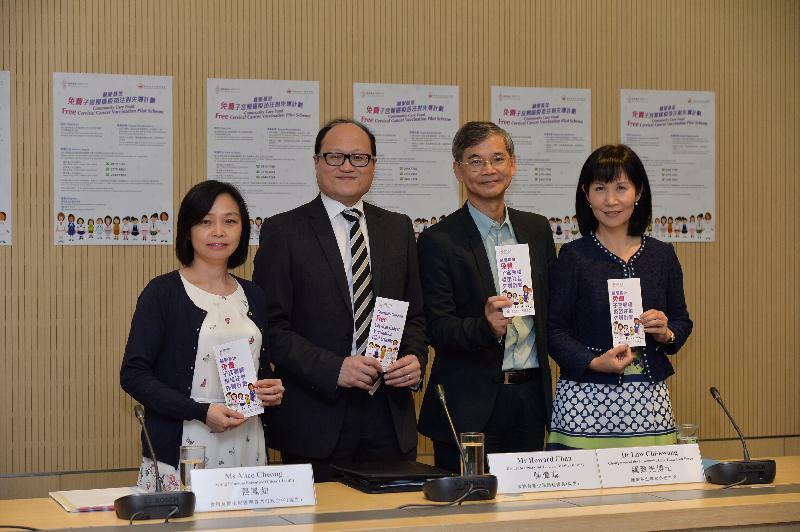 The publicity leaflet of the pilot scheme will be distributed at the Youth Health Care Centres, Women's Clubs and clinics of the FPAHK, Social Security Field Units of the Social Welfare Department and the clinics and health centres under the Department of Health from October 3 onwards. The eligibility, application procedures, publicity video and other details of the pilot scheme are available at CCF website (www.communitycarefund.hk) and the FPAHK website (www.famplan.org.hk/ccfvaccine). For enquiries, please call the pilot scheme hotline at 2919 7878 or email ccfvaccine@famplan.org.hk.